Though heavy metal is filled with wonderful examples of artwork, some of the most memorable are ones whose artwork illustrates the music. 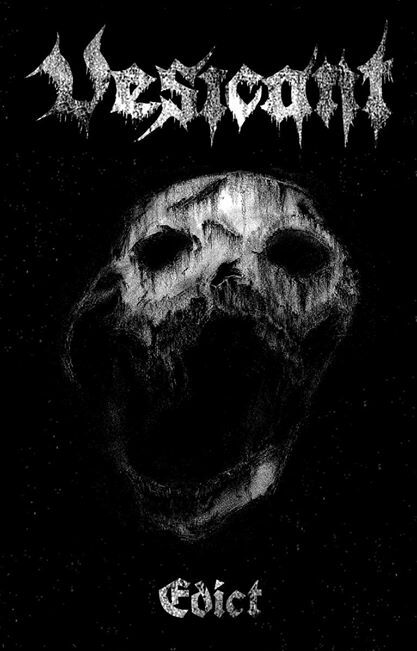 Vesicant’s artwork for their debut demo depicts a skull or desiccated head obscured by high contrast and shadow. Though Vesicant’s demo Edict MMXIV is under 10 minutes, I can not think of a better cover image to convey horror inflicted by dark shadows. Vesicant comes bubbling out of a wonderful and vibrant black/ death scene which is currently populating New Zealand and Australian. In fact, the drummer for Vesicant also shares duties in the full out assault known as Heresiarch. If the atmosphere for the two songs on Edict MMXIV is not entirely clear, then let me tell you Vesicant is ready and willing to destroy with unrelenting force. I think Edict MMXIV might be one of the shortest demos in recent memory which is somewhat disappointing. The release never really gets off the ground and allowed to fully introduce itself aside from a few punches to the face. With that said, interest in Vesicant as a band and potential future work is now fully piqued. If any of these future releases come with this type of album art and accompanying music, I will fully be on board and possibly first in line.